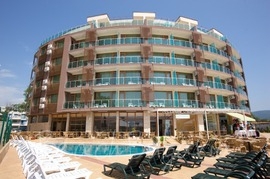 Royal Dreams Aparthotel is situated just a few minutes walk from Cacao Beach in the southern part of Sunny Beach resort. There is a bus stop just a few meters from the complex. 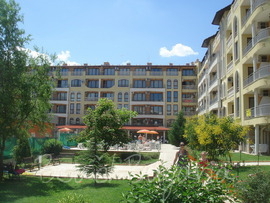 Sea Regal Aparthotel is situated on the beach, near the Cacao Beach, in the most attractive part of Sunny Beach resort. 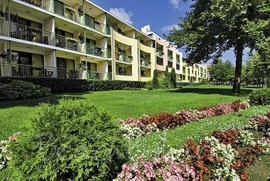 The complex features fully furnished luxury studios, one-bedroom and two- bedroom suites with sea views. Sunset Kosharitsa complex is situated at the foot-hills of the Stara Planina mountain, 6 km away from beaches of Sunny Beach resort and the towns of Nessebar, Sveti Vlas and Pomorie. 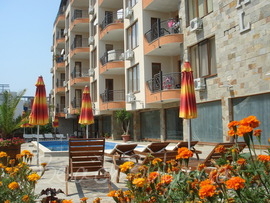 Trakia Garden hotel is situated 250 m from the beach, in a beautiful garden in the central part of Sunny Beach resort. The hotel features 86 double rooms and 6 suites. Trakia Hotel is located 150 m from the beach, close to the centre of Sunny Beach resort. Yalta resort complex is located 350 m from the beach on the road to St. Vlas resort, close to the top attractions and the local restaurants and night clubs in Sunny Beach resort. Dawn Park Apart hotel is situated at 10 minutes walking distance from the beach and at 5 minutes walking distance from the Aqua-park of Sunny Beach resort. Boulevard Boutique hotel is located in the central part of the Sunny Beach resort town, close to Cuban hotel, just 100 m from the beach and close to all entertainment facilities, shops and restaurants. 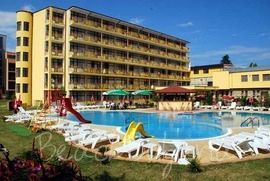 All inclusiveBest deals Obzor Beach Resort Obzor Get free overnights - 21=18, 14=12, 7=6!